When Noah put two of each animal on the Ark, why did he decide to keep mosquitos? We may never know, but we can handle it. Mosquitos are more than annoying; they are the world’s number one killer, carrying diseases in every part of the world. The number one reason there are mosquitos is that there is standing water around. It’s the only place where mosquitos can breed. They must have water to lay their eggs in. When most of us think of standing water, we imagine ponds and big puddles. However, mosquitos will even breed in a plastic cup of water left sitting out. The first thing to do to get rid of mosquitos is to go around your property and look for any standing water. This can be in children’s toys, puddles, water near garages, old trash sitting around, etc. No matter how little water there is, mosquitos will breed in it. Dump it all out. Mosquitos are terrible fliers. They can’t handle wind at even 1 mph. If you can, sit in a breezy location. If you can’t do that, then simply put an electric fan blowing toward you and your group. Aim it at the ground. Mosquitos fly low to stay out of the wind, so create wind near the ground and they can’t get to you. During the day, mosquitos use sight to find victims. You can stop them by wearing light colors that blend in with the surroundings. Dark colors stand out from the horizon. Also, choose tightly woven cloth, as opposed to looser fabrics. Mosquitos can’t get through a tight fabric, so even if they find you, they have to fight to get to you. DEET has a bad reputation, but there isn’t a lot of scientific basis for it. Like everything else, don’t bathe in it and you’ll be fine. Most of us don’t wear insect repellant every day, so we won’t have a problem from the five times in a year we use it. DEET is pretty much the only repellant that has been proven to work against mosquitos and other insects. If you’re hesitant, think of it this way: What’s easy? Using DEET effectively or dealing with West Nile Virus? Use a DEET lotion or wipes, or simply spray it onto your hands and other body parts that will be exposed, like ankles and wrists. Dawn and dusk are the times when the wind tends to die down. That’s when mosquitos can get out and really do a number on you and your passengers. Avoid these times when the wind is calm or non-existent. If you must be out, be covered, even if it’s warm. The wind tends to come back again once it’s full day or full night. 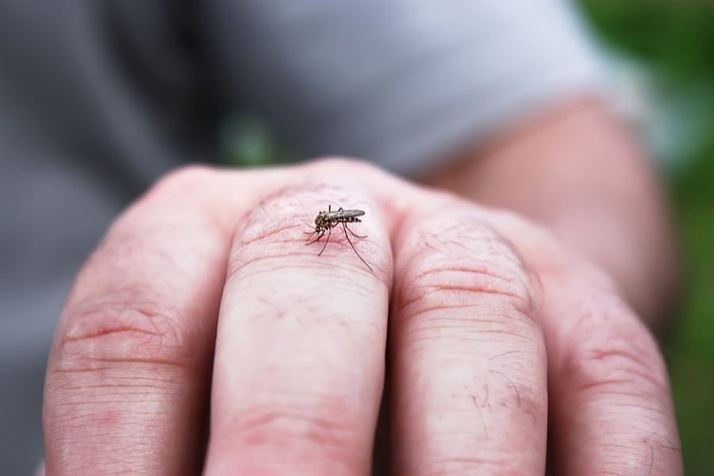 Most people who get sick from mosquito bites in the United States get infections from scratching. Use calamine lotion or an anti-itch cream, but try not scratch. By scratching, you are introducing bacteria into your body by breaking the skin further. Even if you have a fancy bug zapper with lights and attractant hormones, it can’t kill all the mosquitos. You still need to take precautions against mosquitos. Many of these traps are effective, but they will never get all the mosquitos. This one depends on who you ask. The science is a bit sketchy, but so many people swear by these candles and torches that it seems like they might do something. There is evidence that says citronella candles can deter mosquito bites by 50%, which means you still need to take other precautions, like wearing light colored clothes and tight weaves. Long grass creates mosquito condominiums. The little critters will hang onto long grass while waiting for a warm, delicious mammal to run by. If you’ve ever seen a running dog wake up a cloud of mosquitos, it can be disturbing. Keep the grass trimmed and neat, especially around woodpiles and edges. The gutters on your house can be one of the worst culprits for standing water. Get up there and clean them out. Take out leaves and debris so that you don’t have to worry about having a place where mosquitos can breed and terrorize your family. While there are a few other things you can do, these solutions are among the simplest. Be defensive about mosquitos and they won’t ruin every event you attend outdoors.